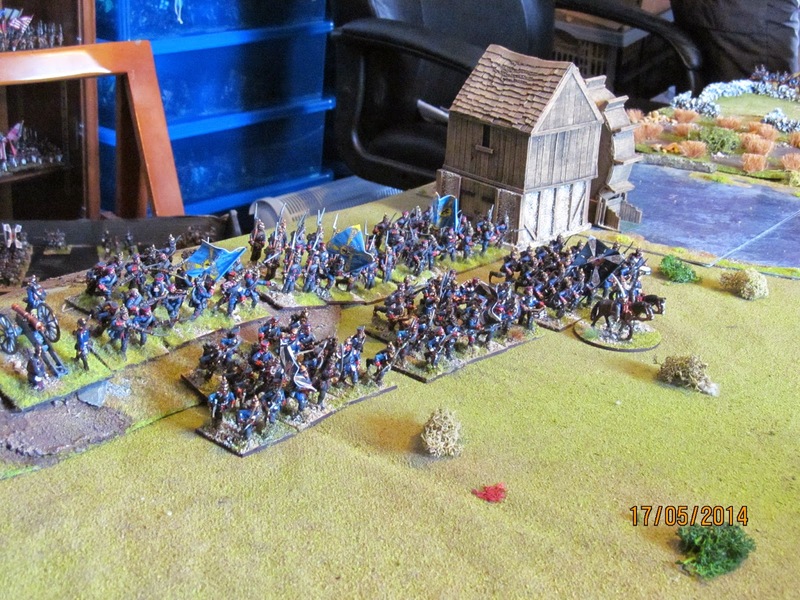 Following last week's game where the Prussians were repulsed, we have now moved forward an hour or so forward in time. The Prussians have regrouped, brought up the remainder of their Corps, and suitably reinforced, will try again to seize the vital bridge crossing so important to their push into Bohemia. 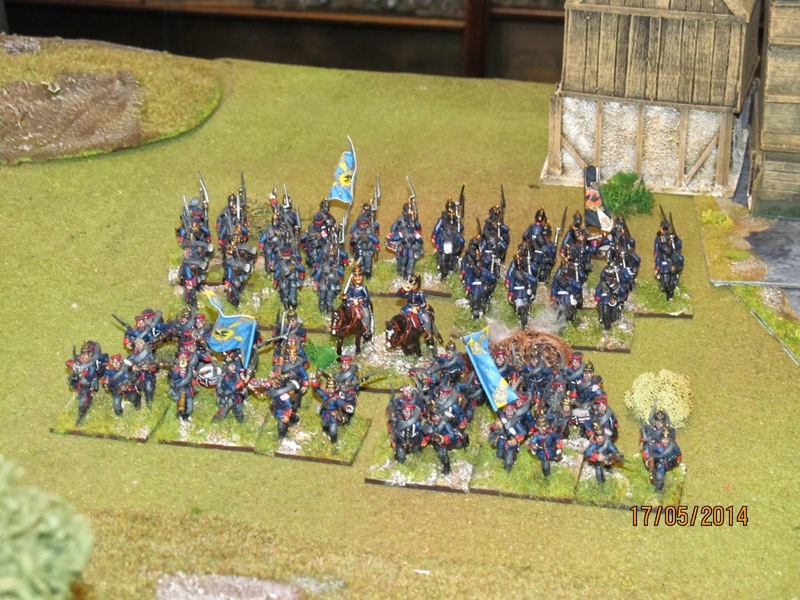 They now have four infantry brigades totalling 20 battalions plus a cavalry brigade and supporting artillery. 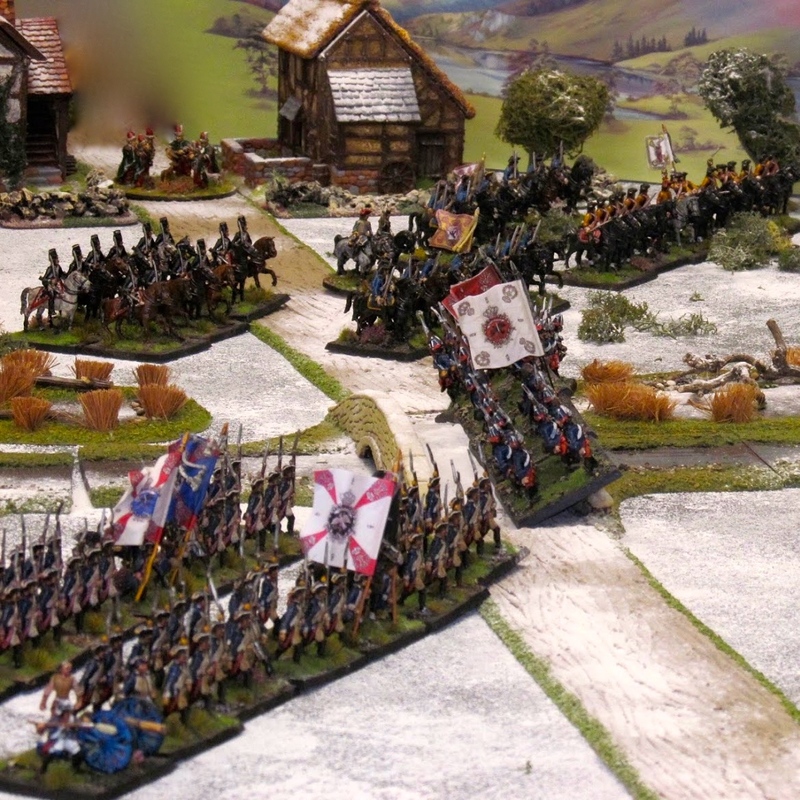 The combined Austrian/Saxon 'Corps' were, despite their initial and perhaps temporary victory, quite battered but are still are viable and dangerous opponent. They have remained in possession of the field so I've 'slipped' the terrain by a foot or two to accommodate areas such as the bridge in their deployment area. Their reserve artillery is now off table but can be redeployed forward if so desired. Apart from that their troops must be deployed more or less (within a foot max) of where they were left at the end of the last game. The Prussian commanders are still 8's with the Corps commander a 9 but I've adjusted the Austrian command rating as they were a bit too mobile. They're now 7's with the overall commander an 8. 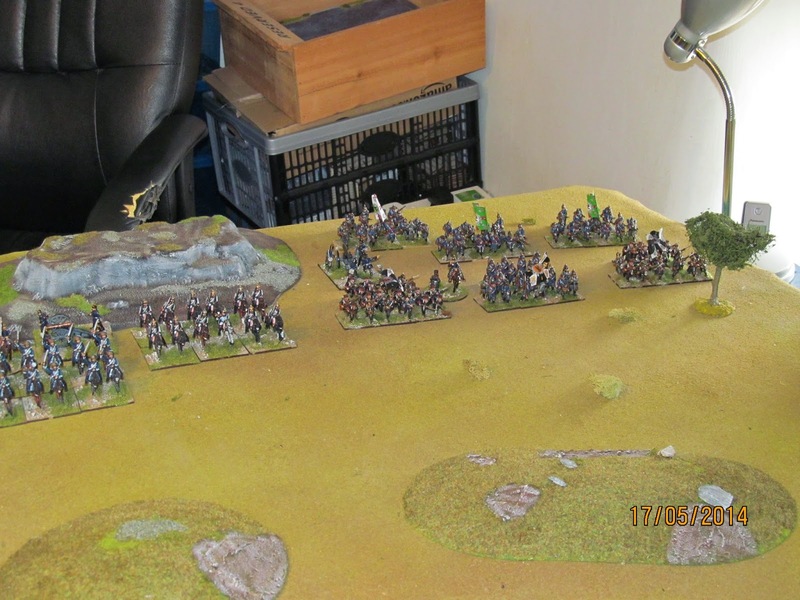 However, when in attack column, the preferred formation for all the Austro/Saxon infantry, they increase to an 8. They can defend in line but any forward/aggressive move must be in storm or attack column as per the history books and tactical doctrine. My friend John (Mc) had the day off on Wednesday so came up for the game. He got the Prussians. 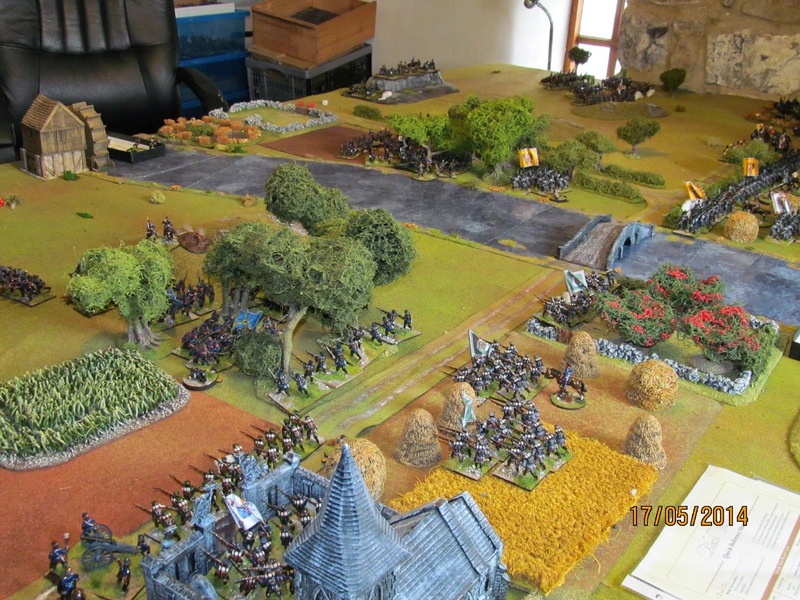 I switched my coat and kept the Austrian brigade along the hedgerow on the right, with the cavalry on the extreme right beyond the wood. 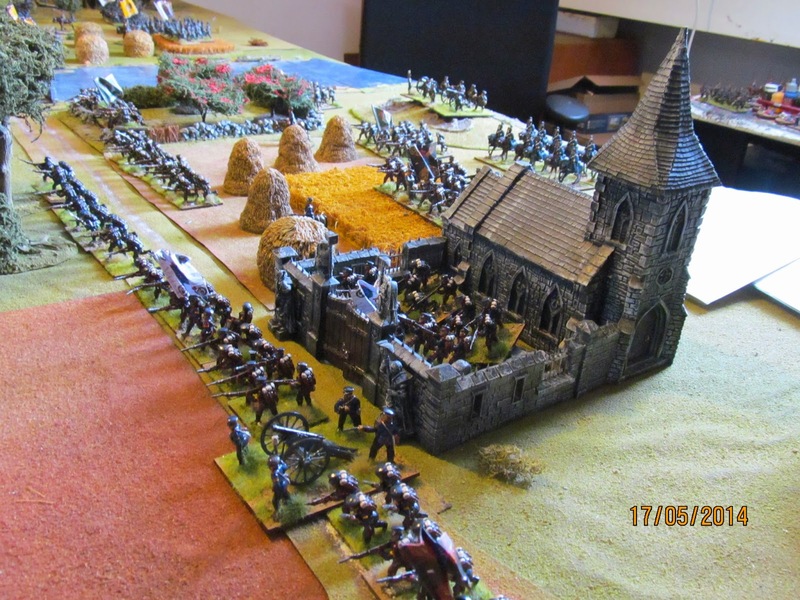 The Saxons occupied the entire area to the left of the river, with units stretching from the orchard to past the churchyard. 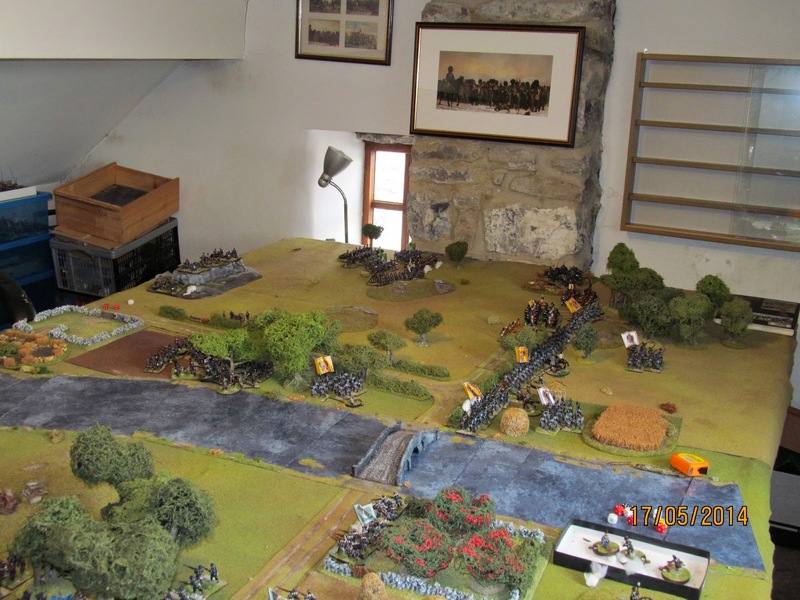 The Prussian advance guard entered the table along the central road, but very slowly due to poor command rolls and one unit was caught in column of march by Austrian artillery which didn't do it much good! 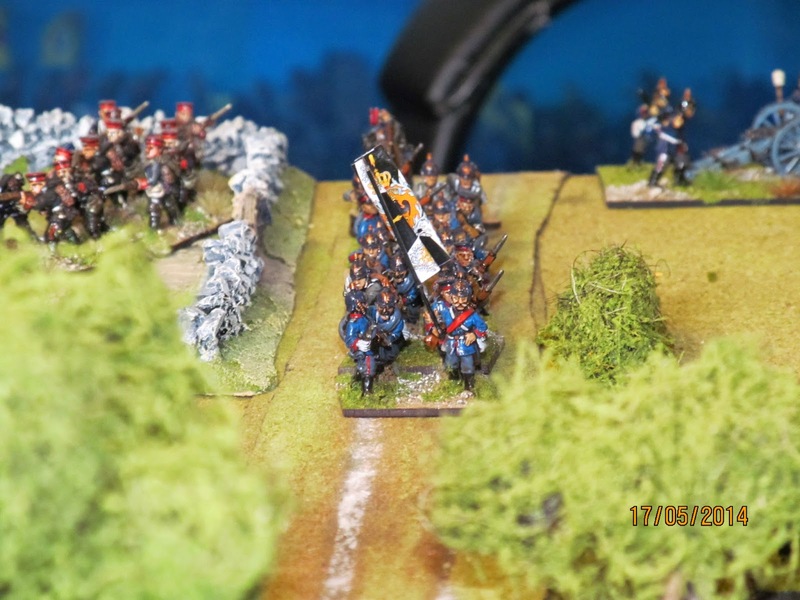 The cavalry occupied the area immediately to the front of the big hill on the Prussian left and were to stay there for much of the game as it turns out. 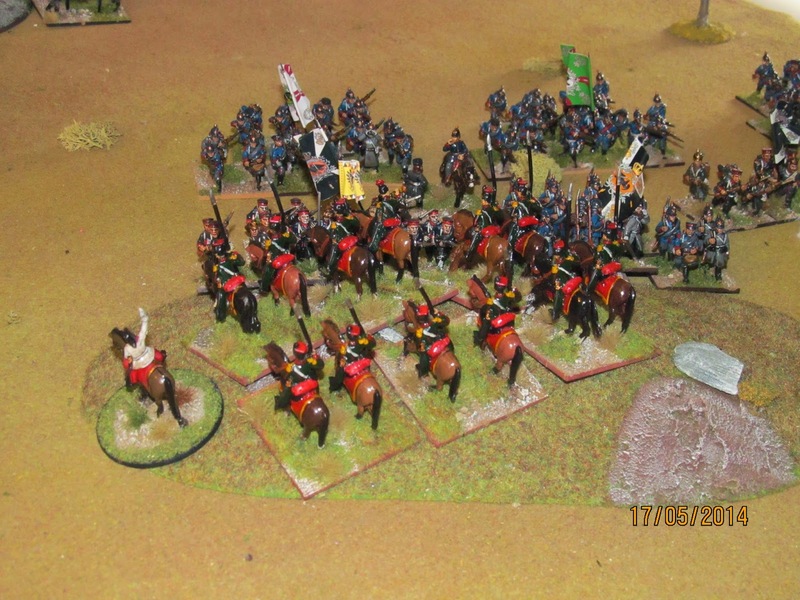 The remainder of their forces appeared over the next couple of moves. The larger brigade of 6 battalions deployed into attack columns on the left while the other two brigades deployed as they entered the battlefield to the right of the river. 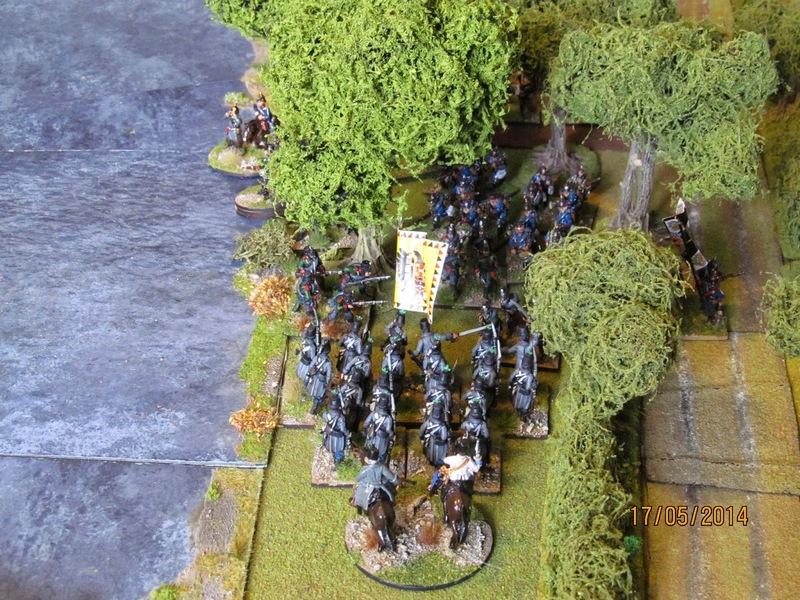 One brigade took its time entering the table and the other managed a blunder which almost saw it plunge into the impassable river! 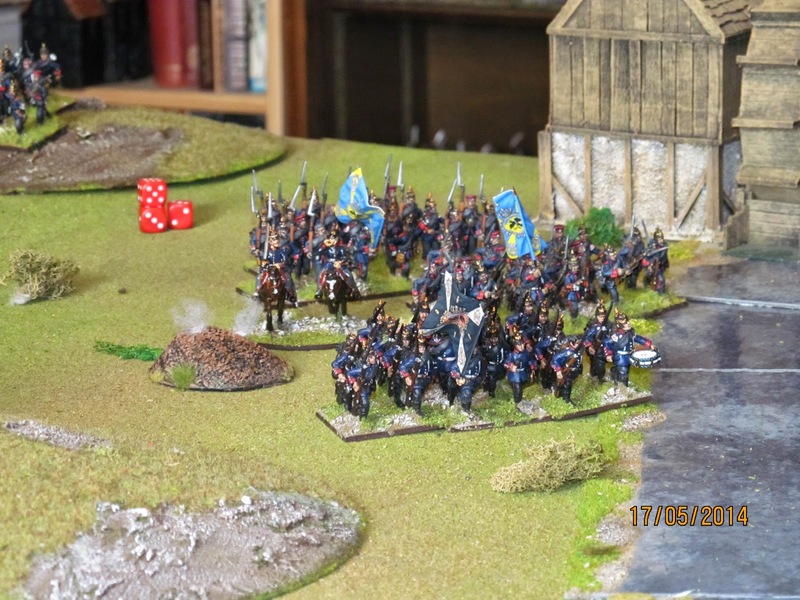 So, sector by sector, on the Austrian right the reserve artillery spent the battle taking potshots at the Prussian cavalry, and kept the Hussars and especially the Cuirassiers in a state of disorder for much of the game. 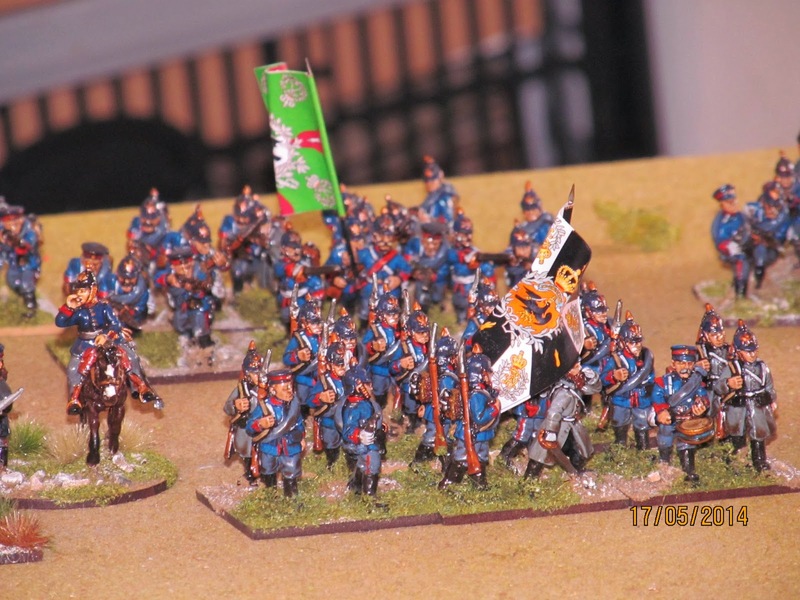 The Prussians advanced very slowly in attack columns. 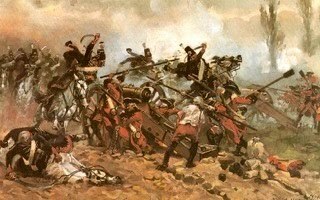 One unit was sheltering behind the crest of a hill when it was hit by Austrian Uhlans in a rather rash charge. 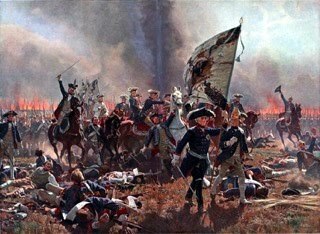 Unable to bring much in the way of fire to bear as the Uhlan's approach was covered by dead ground, the battalion was destroyed, as was one of its supports. 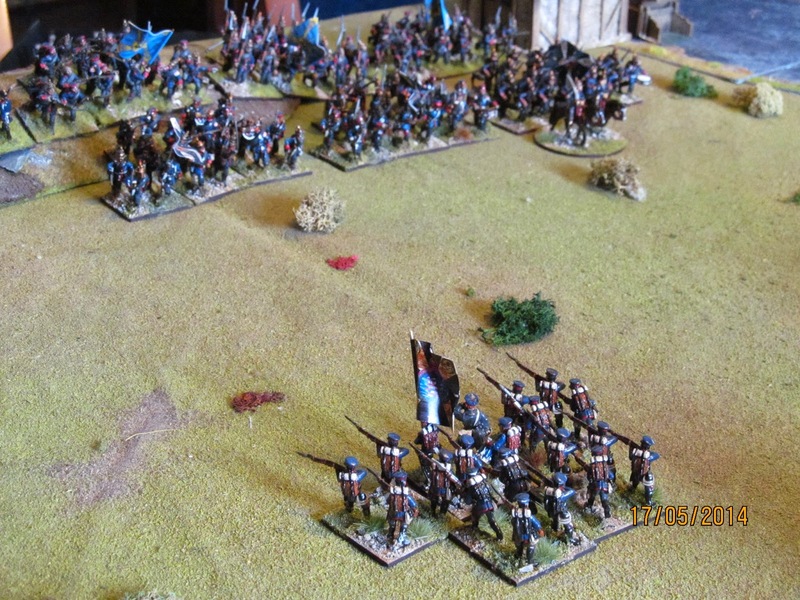 I was lucky to get my Uhlans into contact but as my charge was screened by dead ground almost all of the way and the Prussians were caught in assault column, their closing fire was much reduced and in the end quite ineffective thanks to some timely saves. My Uhlans wisely withdrew and took no more part in the battle but my Cuirassiers were later led in another wild charge, this time against the Prussian Hussars using a 'follow me' order, breaking them before retiring to the dubious safety of a position immediately in front of the main Austrian defensive line in full view of the vengeful Prussian artillery. 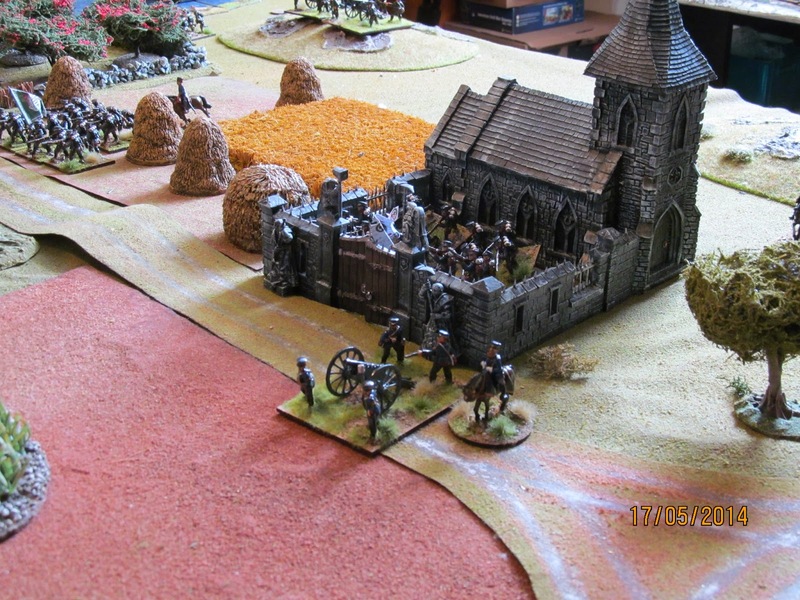 Apart from a continuous exchange of artillery fire not much else happened on this flank as the Prussians were too battered to push forward and the Austrians had a couple of battalions shaken or disordered due to long range artillery fire. 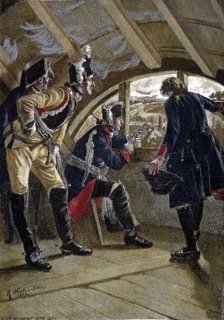 By the river the Prussian advance guard had occupied the wood covering the bridge with a battalion of Jäger, who were supported by three further battalions of infantry and a battery of artillery. After a few rounds of long-range musketry and ineffective artillery fire my C-in-C led a battalion in storm column against the wood. 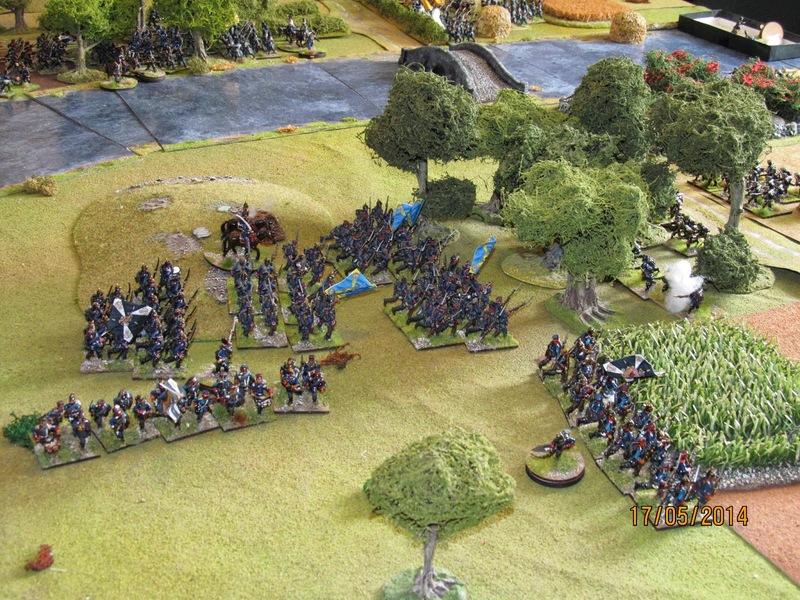 The Jager evaded but the line infantry immediately behind them stood to fight but were driven off in disorder. 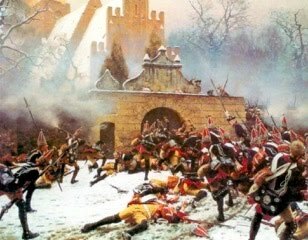 The fact that this all took place in the middle of a wood kind of reduced the effectiveness of the Prussian closing fire, hence the Austrian success! Sadly the Austrians were shaken so any follow up move would have been unwise. On the left flank my Saxons blundered and one battalion charged for three moves right towards the advancing Prussians. They survived for a couple of moves, milling about in disorder but throwing sufficiently good saving rolls to avoid a break test. To make things worse, a couple of moves later a second battalion did the same and actually made it into contact........for a moment at least. Both Saxon (Hessians masquerading as Saxons actually) were broken. No surprise there but they did hold up the Prussians for several vital moves. 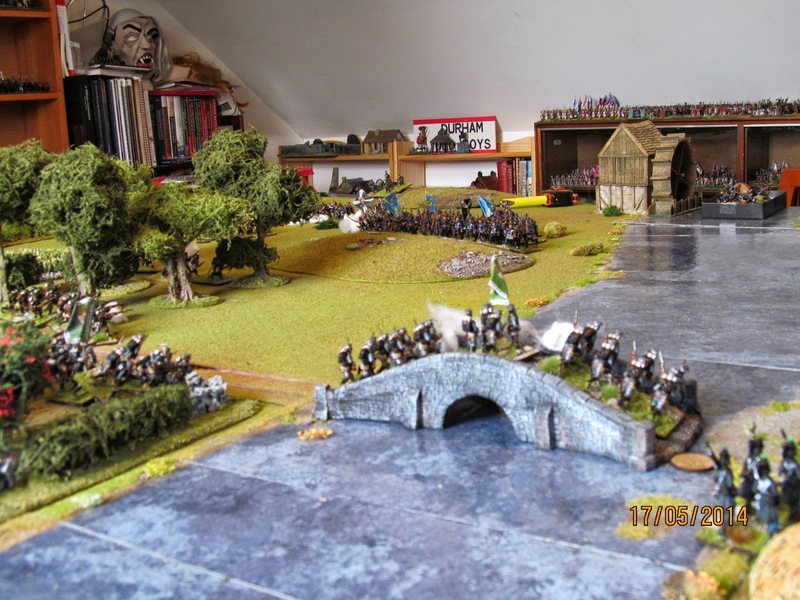 The Prussians attempted an assault against the wood to the (my) left of the bridge. The first attack went very wrong as John threw a blunder and the assault troops promptly moved to the rear in confusion! 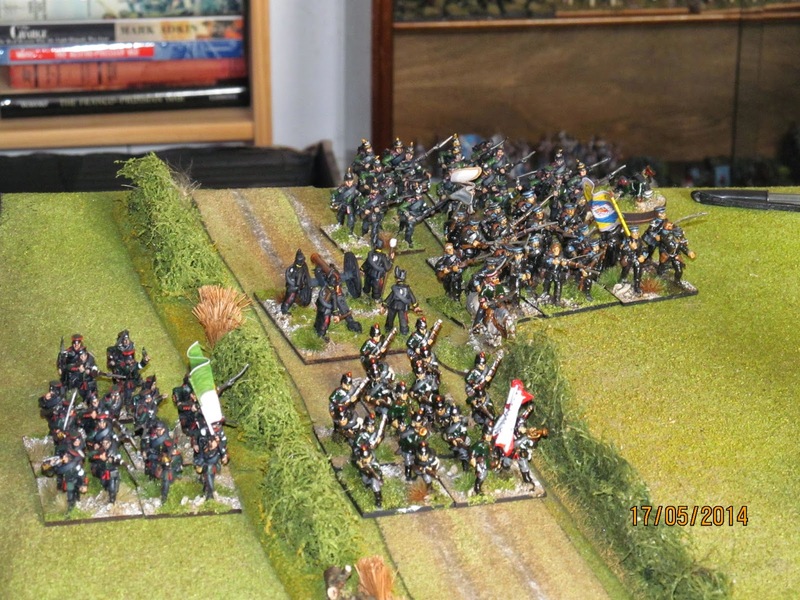 Sadly for me the next move saw the reserve line charge into the woods, and my Jäger were forced to retire. On the Austrian/Saxon extreme left the Prussians were very slow in making much progress against inferior Saxon covering forces. The Prussian brigade were made up of figures representing units from Brunswick, Anhalt, Lippe-Detmold and Saxe-Coberg-Gotha. Wholly inaccurate as they were in reality deployed to Western Germany as part of the Army of the Main, but they were the figures I had. It it added a bit of variety and while the units from the latter two states were almost as good as the Prussians, the former two were less than enthusiastic and showed it in the game! 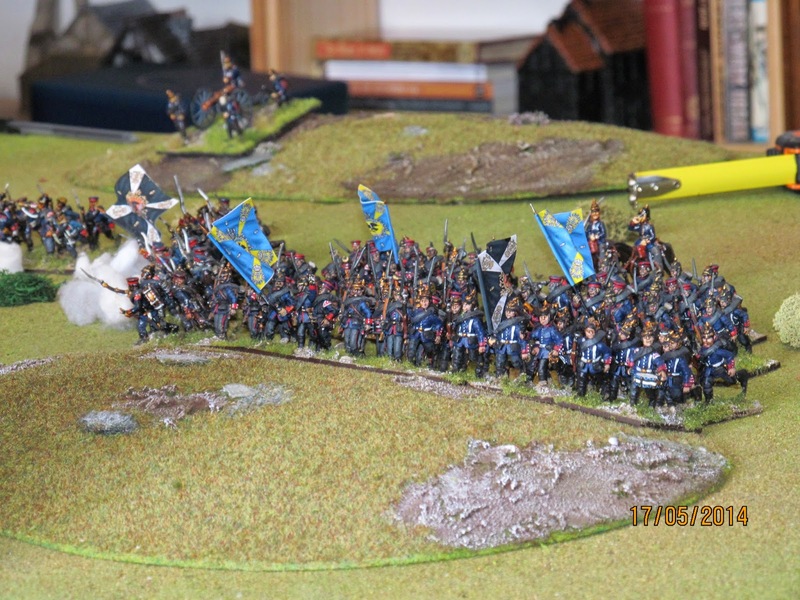 The Prussians tried to consolidate their hold of the wood and push more troops forward but lost heavily to Saxon fire and the attack stalled yet again. 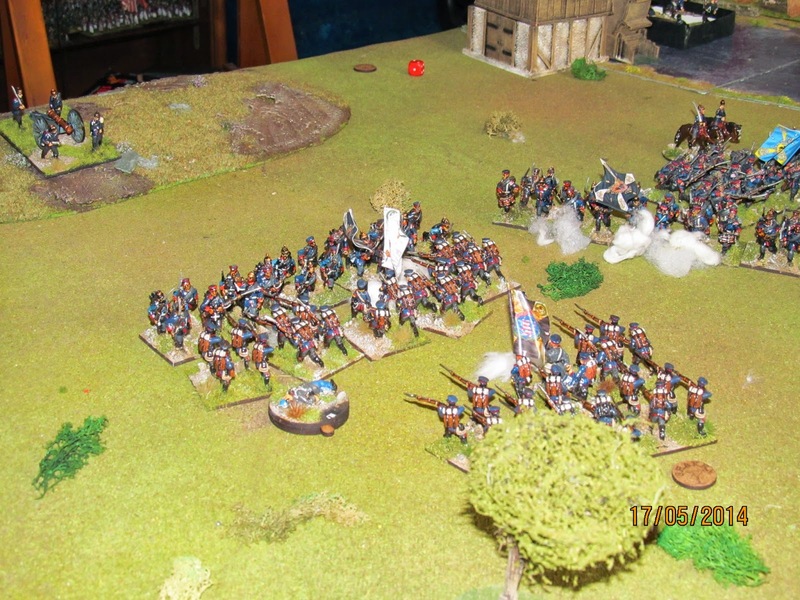 When it became time to call it a day the Prussians were on the verge of gaining the wood to the left of the river, had put the Saxons under severe pressure with one brigade very close to being broken, but were otherwise making very slow or no progress. They had come off far worse in their assault but had been more successful than in their earlier attack under my command. I was happier with the rules and the adaptations made this time and felt that it worked far better. 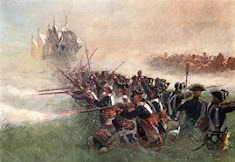 The scenario was always going to be a tough one for the Prussians but not an impossible one. 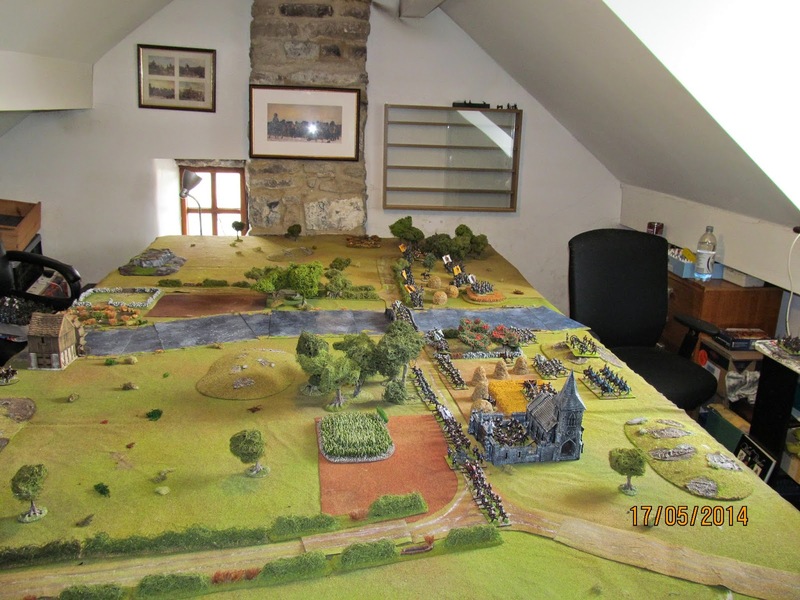 Next time (ie in about an hour and a bit in game time) we will see another and I suspect more successful attempt to dislodge the now seriously battered Austrian and Saxon forces. 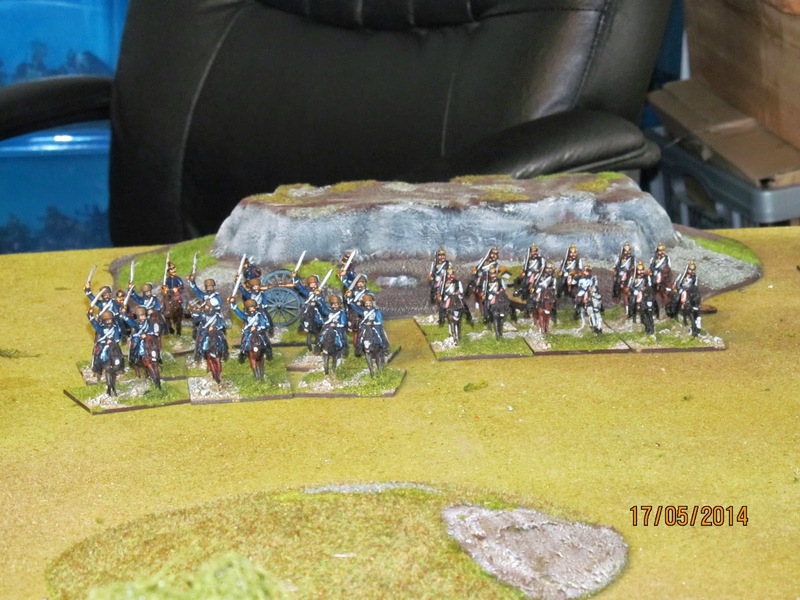 Nice layout and terrific looking troops. Looking forward to Part 2. Once again, a fine looking game! Good luck on the Lottery ~ though not tonight please, as its my turn!